It's easy to find a bad pair of headphones. They're everywhere. Finding a good pair is a challenge, unless you're willing to fork out everything in your wallet for a name brand set. Status Audio's CB-1 headphones buck the trend by being both affordable and quality. The CB-1 headphones hide their brand by having no logos anywhere in sight. The focus is on the sound. And in our reviews, we found them to have epic sound. They're labeled as studio monitor headphones as well, so for folks working on their own music, these headphones are a viable option. On top of their great sound, the CB-1 headphones are pretty cheap, and the large foam ear cups keep them comfortable. Normally they start at $79 (£59, which is already a good price for studio monitor headphones, but we've got a promo code (TCHRDR25) you can use on Amazon to slash 25% off that price, bringing them down to $59 (£44). 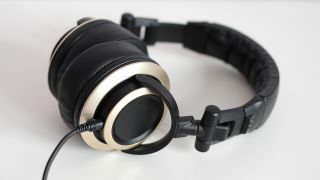 The headphones feature a detachable cable, and the package includes both a straight and a coiled cable. Both cables end in a 3.5mm headphone jack, but a quarter-inch adapter is also included. If you're interested, follow the link below to see the Status Audio CB-1 headphones on Amazon and use promo code "TCHRDR25" to save 25%.